Enhanced Abilities: Due to Apocalypse's methods, Stryfe's strength, agility, speed, durability and endurance have all been enhanced. Telepathy: Stryfe has vast telepathic powers that allow him to read minds and project the thoughts. He can create realistic telepathic illusions, telepathically mask his presence from others, mentally link with any person, control the minds of others, possess the mind of another, erect a psychic shield for protection of himself and of others minds, project psionic force bolts, travel and communicate with others astrally and transfer both his mind and powers into other host bodies. Telekinesis: Stryfe has vast telekinetic powers, allowing him very fine control over objects, by use of his mind alone. This allows him to disassemble complex devices explosively (separating every last component, such as screws, nuts, circuit boards, etc.) and, just as quickly, easily assemble complex devices. He can also alter atomic structures, create powerful force fields, create psionic spikes, concussive blasts and fly. Stryfe is the clone of Nathan Christopher Summers, alias Cable, the son of Cyclops of the X-Men. Nearly two millennia in an alternate future, the aged mutant Mother Askani, alias Rachel Summers, led the Askani cult, which opposed the rule of Earth by the long-lived mutant tyrant Apocalypse. In need of a powerful warrior who would oppose Apocalypse, Mother Askani sent a female member of the cult back to the X-Men's own time period. The Apocalypse of that time infected the infant Nathan Christopher Summers with a techno-organic virus that was rapidly spreading through his body and, if not stopped, would kill him. The Askani cult member persuaded Cyclops to let her take the infant to the far future, where advanced medical science could save his life. Once the infant Nathan had arrived in the Askani's time, Mother Askani had him cloned, so that if Nathan himself died, the cult could raise his clone to be their saviour. The clone's growth was greatly accelerated until he was the same age as Nathan himself. The Askani succeeded in halting the spread of the techno-organic virus in Nathan's body, thereby saving his life. However, Apocalypse and his forces then invaded the Askani's hiding place. Apocalypse found the infant clone and decided to raise him himself. The Askani took the original Nathan to safety, and he was raised to early adolescence by Cyclops and his wife Phoenix, whom Mother Askani transported to the Askani's time period. 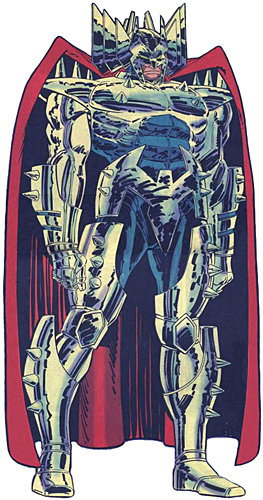 Apocalypse named the clone Stryfe and encouraged the boy's arrogance and cruelty as he grew into adolescence. Stryfe was watched over by Apocalypse's aide Ch'vayre, who regarded the boy's malevolence with mixed feelings. Neither Apocalypse nor Stryfe was aware that Stryfe was actually a clone.